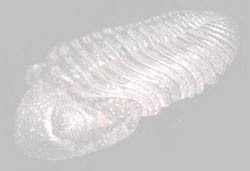 T he trilobites were one of the most successful groups of organisms to have ever lived. The first trilobite appeared in the Lower Cambrian and became extinct by the end of Permian. In their 350 million years of existence, trilobites evolved into diverse forms adapting to different marine environments. Trilobites are among the first to have developed the highly sophisticated visual organs. Trilobites are arthropods, their bodies divided into segments; protected themselves by exoskeleton. Compound eyes in trilobites are thought to be related to the compound eyes of the modern arthropods. Modern day arthropods include spiders, shrimps, lobster and other joint-legged organisms. The most characteristic feature is the three lobes found along the posterior-anterior axis. Its name is also derived from this characteristic: tri-lob-ite (three lobed things). The largest trilobites were measured up to more than a meter long and the smallest reached a few millimeters. On average, trilobites are two and seven centimetres long. Some had spikes all over the body. Some lacked eyes or had elaborate extensions. Use the buttons below to navigate as instructed. Text Copyright © 1999 Reby Lee. please see References for sources.